← My daughter reads fast, but when I ask her to summarize, she can’t explain well. What do I do? My first grader seems clueless when it comes to rhymes. Are rhymes important? Yes and no. Being able to hear rhymes (sometimes called word families) helps a child to recognize that many of the last sounds in words are similar and are often spelled the same. Hat, cat, fat and sat all have similar rhymes and are spelled with the same ending letters. When a new reader figures out that many words have ending patterns and don’t need to be learned from scratch, these patterns might seem like helpful short-cuts. In a one-syllable word, a rhyme is considered everything but the initial sound (called by reading experts the onset sound). So eight, bait and Kate all rhyme even though they are spelled differently. However, reading research shows that being able to recognize rhymes is not the most important skill for a beginning reader. Other skills such as matching a sound to a letter or pair of letters, or being able to break apart a word into its phonemes (separate sounds), or blending separate sounds into words are more important skills than rhyming and predict better whether a child will learn to read. Recent research shows that learning how to read sometimes increases a child’s ability to recognize rhymes, rather than the other way around (McNorgan, Awati, Desroches, & Booth, 2014). Recognizing rhymes can be fun though. You might try reading nursery rhymes to your child, emphasizing the rhyming words. Or you might try singing childish songs such as “The Itsy Bitsy Spider” or “Three Blind Mice” with your child. Sometimes replacing the second rhyming word with a nonsensical rhyming word can jolt the child into supplying the correct rhyming word. This can lead to a comment by you about finding the correct rhyming word. 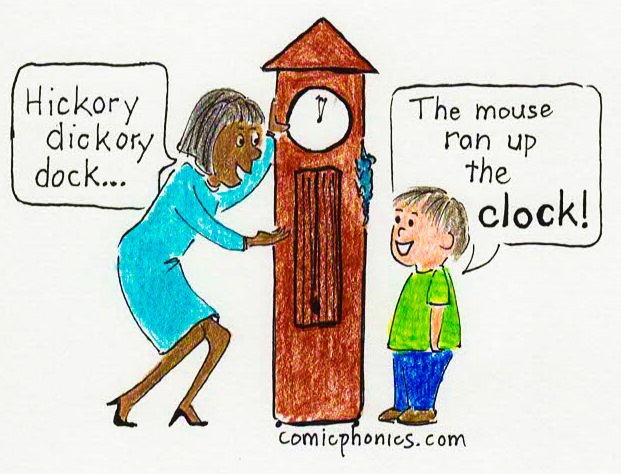 Don’t fret about your child not recognizing rhymes, especially if your child is ESL. With time we all figure it out. Focus on the more important phonics skills. This entry was posted in CVC words, letter sounds, phonics and tagged rhymes. Bookmark the permalink.